This classic deviled eggs recipe uses mayo, mustard, sour cream, and a collection of seasonings that makes these the BEST deviled eggs you’ll ever eat! 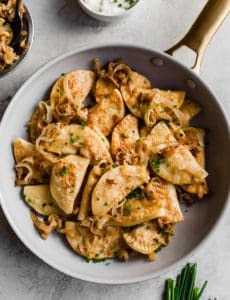 Whether you’re headed to a picnic, New Year’s Eve party, or a holiday brunch, these make a wonderful addition to any menu. Are you hosting on Sunday? Dinner or brunch? Do you have a menu ready? I want to hear allllll about it! 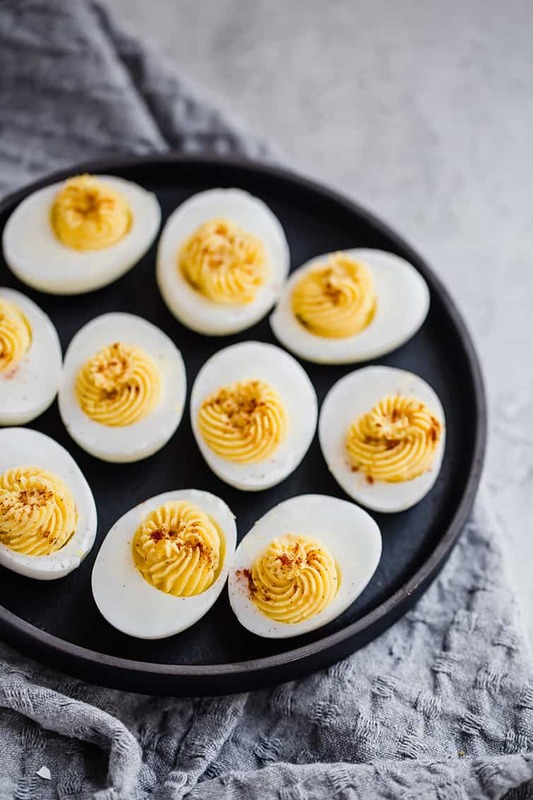 In preparation for the holiday, I’m coming at you today with my favorite recipe for deviled eggs. 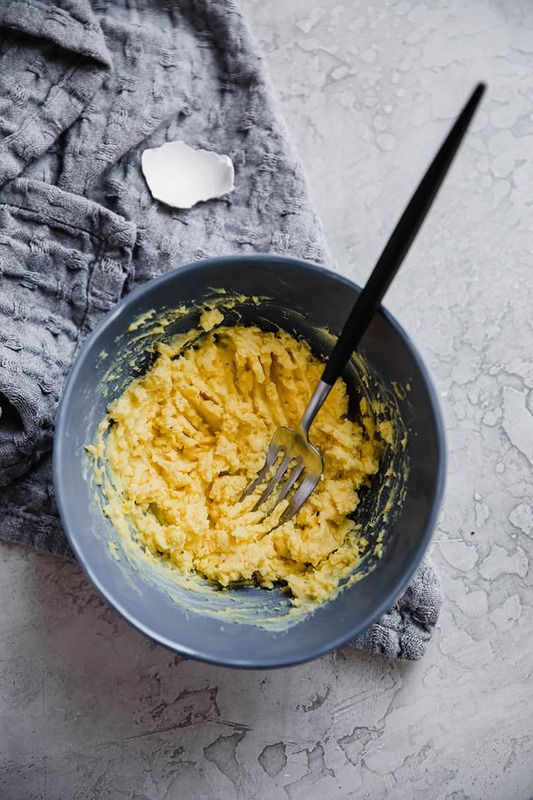 This is such a classic dish and can be dressed up in so many different ways, but my favorite is this stripped-down version that lets the egg yolks and simple seasonings shine. Hard-boil eggs. You’ll do a classic hard-boil here – cover eggs with water, bring to a boil, then cover and let sit off heat for 10 minutes. Ice bath to keep the eggs from overcooking. Once the water is drained, you’ll plunge them into a bowl of ice water to stop the cooking process. This ensures that the yolks don’t end up dry; we want nice and creamy yolks for that filling! Peel and slice the eggs. Once the eggs have cooled off, you’ll peel them, slice them in half lengthwise, and scoop out those yolks. 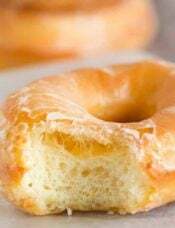 Make the filling using the yolks, mayonnaise, sour cream, white vinegar, brown mustard, a little sugar, salt and pepper. Fill the egg whites! Arrange the egg whites on your serving platter, then transfer the filling mixture to a piping bag, plastic baggie, or just use a spoon to mound the filling. 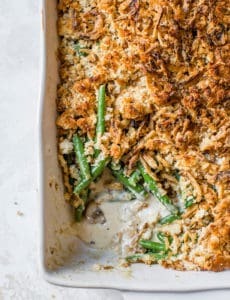 I really love this filling for how easy it is to mix together, its simple list of ingredients, and how they all work together create a phenomenal punch of flavor that is anything but boring. Mashed-up avocado stirred into the filling. Relish or your favorite chopped pickles. Mix up the seasonings for different flavor profiles. 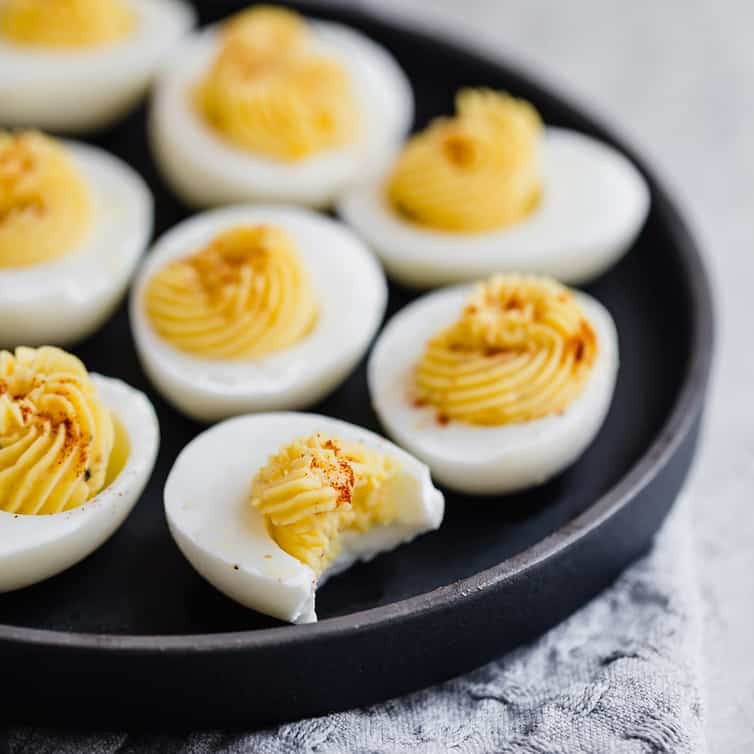 What are your favorite ingredients to include in the filling for deviled eggs? 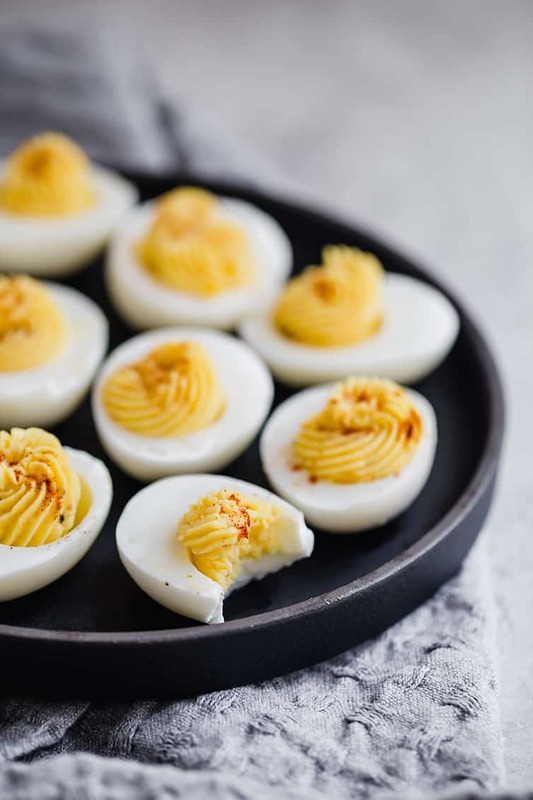 Whether you’re hosting a holiday, been asked to bring a dish, or are heading to a picnic some time this summer, a batch of classic deviled eggs will never go out of style. I’d love to hear your favorite ways to prepare them in the comments below! Place eggs in medium saucepan, cover with 1 inch of water, and bring to a boil over high heat. Remove the pan from heat, cover and let stand 10 minutes. Meanwhile, fill medium bowl with 1 quart water and 1 dozen ice cubes. Pour off water from saucepan and gently shake pan back and forth to crack shells. Transfer eggs to ice water with slotted spoon and let cool 5 minutes. Peel the eggs and slice in half lengthwise. Transfer the yolks to a small bowl. 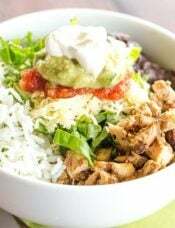 Add the remaining ingredients, mashing the mixture against the sides of the bowl until smooth. 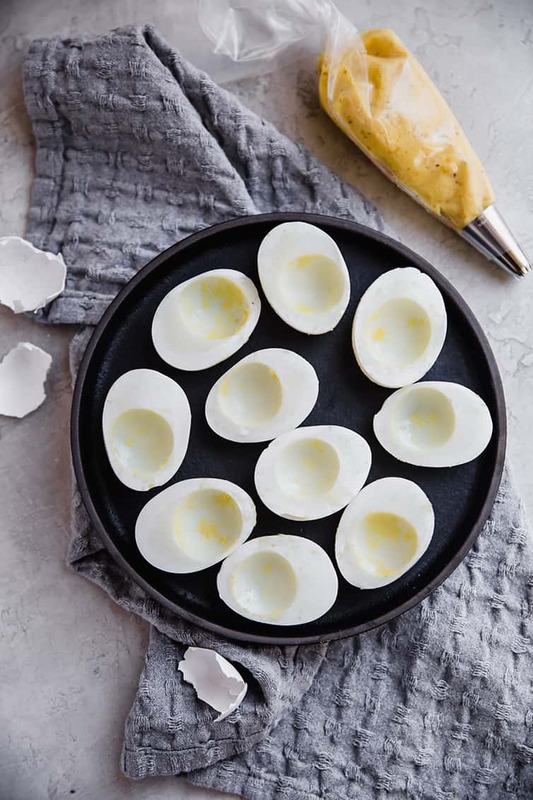 Arrange the egg whites on a serving platter and fill with the yolk mixture, mounding the filling about ½ inch above the whites. (You can put the yolk mixture into a sandwich baggie and snip off the end, use a piping bag with decorating tip, or just a good ol' spoon.) Serve immediately. Make-Ahead Note: You can make the deviled eggs up to 2 days ahead. 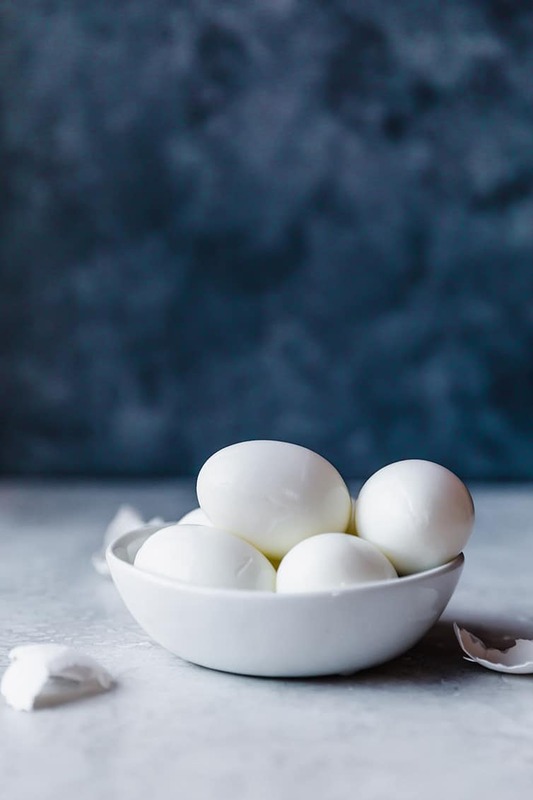 Wrap the peeled egg white halves tightly with a double layer of plastic wrap and place the filling a zipper lock plastic bag, squeezing out all the air. 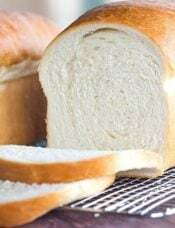 Refrigerate until ready to fill and serve. 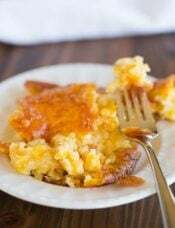 Update Notes: This recipe was originally published in April 2011; updated in April 2019 with new photos and better recipe instructions. wow, eggs are very delicious and I love to eat an egg every day. Try adding a splash of dill pickle juice instead of the vinegar…delish!! What type of spicy brown mustard do you recommend? I have no idea what this might be. These sound yummy. 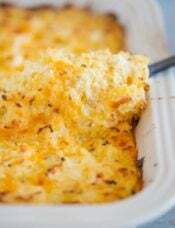 Michelle thanks for posting a recipe that many may know by heart. 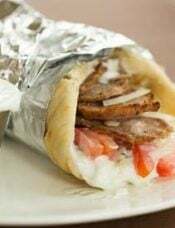 I plan to use this but I am all about making things ahead if possible so I am wondering do I wrap the egg white halves all together in double wrap or individually? I’m assuming assembling them ahead of time is not recommended? Is that right? Sorry for the very basic questions. I have a question about the vinegar. I always have apple cider vinegar in the fridge, not white distilled vinegar. Will it really change the taste too much if I use that instead? Thx! Is that cayenne or paprika sprinkled on the yokes? Thank you! I’m glad to find the recipe in classic way. We’ve always made the same recipe. Some might say boring, but to us it’s a classic. It’s close to your recipe…we mix in mustard, mayo, salt n pepper. That’s about it. We top half of the deviled eggs w a sliced green olive w pimento inside so they look pretty with that little bit of red from pimento. Then we sprinkle the other “plain” ones with paprika. We dont mess with the recipe..they are so good, being simply made. I’m sure my Grandma must have taught my Mom how to make them. She would have never tasted them before…now we make them every year..a few times a year. 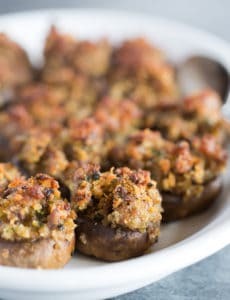 This is one of these classic appetizers that is timeless and liked by most everyone. You can’t go wrong with including these at a party or get-together.